Will Framus & Warwick's Rock 'n Ruler improve your guitar's setup? 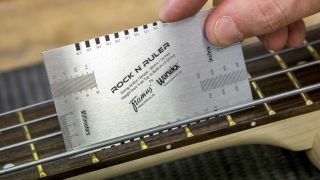 We've been somewhat stationary in our stationery coverage lately, but we're willing to bend the rules (cough) for Framus & Warwick's excellently named Rock 'n Ruler. Aimed at all areas of guitar setup where measurements come in handy, the stainless steel-bodied R'NR features gauges for adjusting string height, neck curvature and string intervals, and packs measurements in metric and imperial units - so, whether you're a fan of millimetres or inches, you're in luck. What's more, when you flip it over, suggested actions for electric, acoustic and bass guitars are supplied as a handy reference. Now we have the measure of it (ouch), the Rock 'n Ruler looks to be a useful piece of kit indeed for any toolbox/pencil case. It's available now at an appropriately precise £7.87.